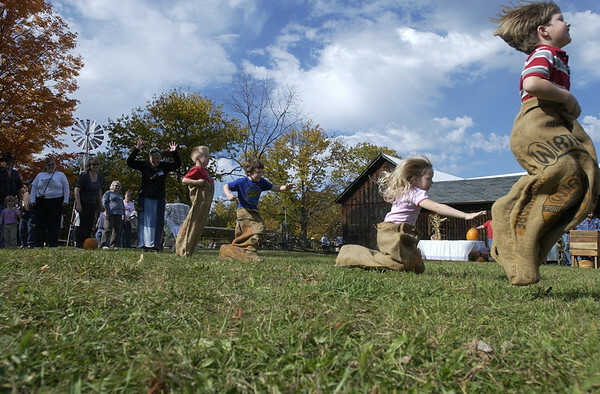 David Riess, 6, of Traverse City, nears the finish line in a sack race as some of his fellow competitors fall at the seventh annual Harvest Gathering at the Samels farm Sunday in Williamsburg. The festival featured tours of the farm, barns and outbuildings dotting the grounds of the turn-of-the-century farm on Skegemog Point Road. The Samels Family Heritage Society put on the festival featuring numerous demonstrations, including a blacksmith shop, an apple press, shingle making and grain milled with power from a 'hit and miss' engine.